Another year is rapidly drawing to an end, Christmas is just around the corner and summer has finally arrived! The AGM has come and gone and since it is not an election year this year, the CPBA committee is as was – yes, afraid so, I am still the President 😊 Together with Winnie Chung and Philip Tan (VPs), Louie Yuan (Secretary), Billy Bong (Treasurer) and general committee – Eric Kog, Alan Kong, Kevin Tan, Richard Wong and Janice Choo. Welcome to the new members, Sarah Jin, Jennifer He, Peter Zhong, Neil Migliorisi, Chong Ming Gohand Anthony Linand our returning members, Elizabeth Ho, David Lam and Eric Cheung. Sometime ago, I mentioned that we have a ‘new arm’ to CPBA – the Young Professionals. We are seeking young professionals and entrepreneurs to join this group and engage in social activities and events. The CPBA YP group recently hosted a basketball session whereby participants were welcome to join in and shoot some baskets, play a game and simply, make friends. The next CPBA YP session will be either badminton or golf – suggestions welcome. At this time of year, I grow homesick. thinking of family and the cold weather (that is associated with Christmas), even though I have been in Australia for more than 20 years. It is a time for reflection – reminiscing childhood days, old friends and the year that was. I hope 2018 has been good for you – family, business and all other things. I hope you have all received a notice of this. A time to meet and make new connections as well as re-connecting with old. 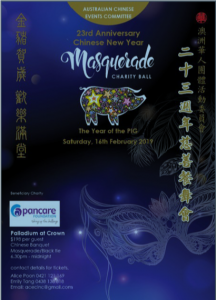 After Christmas and the New Year, comes the Chinese New Year, the Year of the Pig and the annual Chinese New Year Charity Ballon 16thFebruary 2019 at Crown Palladium. An event not to be missed with a Beatles Tribute entertainment. 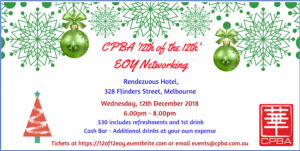 CPBA is on the organising committee for this event – the main beneficiary being Pancare Foundation for 2019. I hope you are able to attend – all for a good cause. Interested? You can book tickets with me or with Alice as mentioned on the poster. We also have a members’ WeChat group – by invitation and strictly for members only! If you are a member and wish tobe in the group, let me know and I will get Louie, our secretary, to send you an invite. Wishing you and your families, a very, very Merry Christmas and a Happy New Year for 2019. To those travelling over this festive season, safe travels!